SAAF’s Thornhill Lopez Center on 4th is an exciting project that offers essential resources to youth who identify as part of the lesbian, gay, bisexual, transgender, & queer (LGBTQ) community as well as their youth allies. For additional questions and support opportunities, please contact Travis Craddock, SAAF’s Director of Development, at (520) 547-6105 or tcraddock@saaf.org. 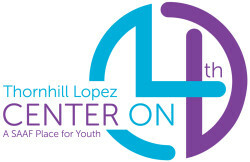 Support the Thornhill Lopez Center on 4th with your tax deductible contribution TODAY!